The guest in Beija Flor can feel at home, it has multiple common spaces that allow you to be in peace and at the same time share the experience with other travelers. It has a spacious kitchen, living room and dining room. The patio is endowed with aromatic herbs which can be freely consumed. 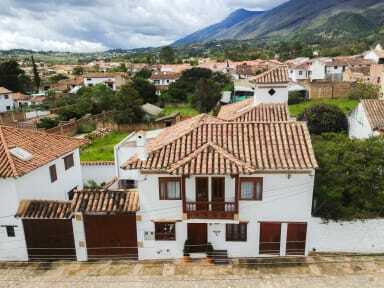 Villa de Leyva is the northeast of Bogotá, famous for the colonial buildings of 17th-century, our location is near of the main plaza of just two Blocks away. All rooms have daylight and ventilation, each of them has wardrobes, two of them have a private bathroom.We have different types of rooms, two for couples (Private or not private bathroom), one for family and the last one with multiple single beds. Guests can make use of the whole house. 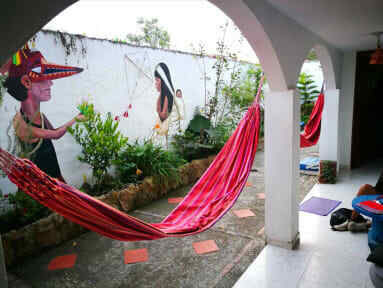 We have laundry service, wi-fi, hammocks and garage. We have a special three - wheeled vehicle (TUK - TUK) which is destined to the tourist offers of the region. Pets are more than welcome. Breakfast not included - 7.000 COP per person per day.